"Suicide in this country really is a problem that is impacted by so many factors. It's not just a mental health concern," says Deborah Stone, a behavioral scientist at the CDC and the lead author of the new study. "There are many different circumstances and factors that contribute to suicide. And so that's one of the things that this study really shows us. It points to the need for a comprehensive approach to prevention." She and her colleagues collected data on suicides from every state. 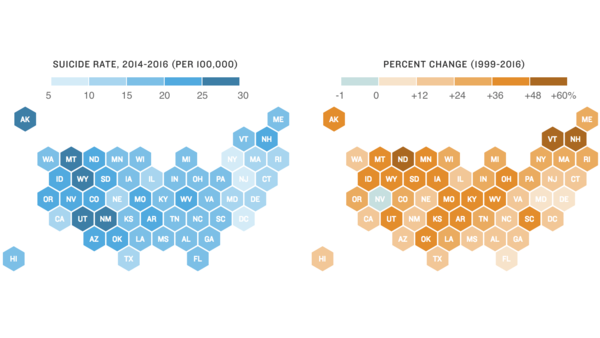 In addition, to better understand the circumstances surrounding suicide, they turned to more detailed information collected by 27 states on suicides that occurred in 2015. The rise in suicide rates was highest in the central, northern region of the U.S., with North Dakota, for example, seeing a 57.6 percent increase since 1999. Nevada was the only state that saw no increase, and Delaware saw the smallest increase which was 5.9 percent. Guns were the most common method used for suicide, accounting for almost half of the people who died. Often, the suicide seemed to happen without warning: 54 percent of the people who killed themselves didn't have a previously known mental health issue. "Instead, these folks were suffering from other issues, such as relationship problems, substance misuse, physical health problems, job or financial problems, and recent crises or things that were coming up in their lives that they were anticipating," says Stone. Researchers and advocacy groups who work to prevent suicide say the report shows that much more needs to be done to tackle this growing problem. "None of this is surprising information, which is not to trivialize its importance. I think it captures a lot of trends that we've been becoming more and more aware of over recent years," says psychologist Michael Anestis at the University of Southern Mississippi, who researches suicide and is the author of Guns and Suicide: An American Epidemic. He thinks the general public commonly pictures someone who had been getting treatment for a long period before killing themselves, like fashion designer Kate Spade, who died this week, but that's often not the case. That means any public health effort to reduce suicides can't solely focus on those who have reached out for help. It has to be paired with measures that would make suicidal people less likely to die even if they never went to see a doctor. The CDC report cites several different approaches, such as working to stabilize housing and teaching coping and problem-solving skills early in life. The report also cites the need to reduce "access to lethal means" but without explicitly discussing firearms or controversial issues such as gun control legislation. Asked whether that was a deliberate omission, because of the political climate surrounding gun control, Stone said that suicide rates have been increasing across all methods. "So it's not just about firearms, it's also about other methods of suicide such as hanging, suffocation, poisoning and the like," she said. "We are concerned with all aspects of suicide prevention, including access to lethal means, and so we do include that in a comprehensive approach to suicide prevention." "American suicide is predominantly a firearm issue. Anytime we want to resolve something that involves firearms, we've need to talk about firearms explicitly," he says. "The conversation about firearms and suicide doesn't have to be a debate about the Second Amendment. It could be a debate about where can we find some common ground that doesn't simply involve only talking about people with mental illnesses, because as this paper shows, that's not going to get the job done." "You may be thinking about it over time, but that moment when you actually make an attempt is a very short window," he explains. "If you could make it harder to make that attempt by not having access to the means, often what happens is the feelings will pass, it gives people time for someone to intervene and get them help, so that is a really important preventative step that can be done. And there's good research to support that." Suicide researchers already know a lot of the information in this new report, says Gebbia, "but the public doesn't. And so a report like this really draws attention to the fact that we need to do a whole lot more to prevent suicide, to save lives." He points out, for example, that the nation currently has no federally funded suicide prevention program for adults. "There are some for youth, but they're very, very tiny," says Gebbia. "We can't expect a major public health problem like this to be addressed unless we see the investment." The CDC said that people can learn about warning signs of suicide to help people at risk. One resource is the website: www.BeThe1to.com. To reach the National Suicide Prevention Lifeline, call 1-800-273-TALK (8255). GREENFIELDBOYCE: So they know the right questions to ask and places to reach out for help. Nell Greenfieldboyce, NPR News. Transcript provided by NPR, Copyright NPR.